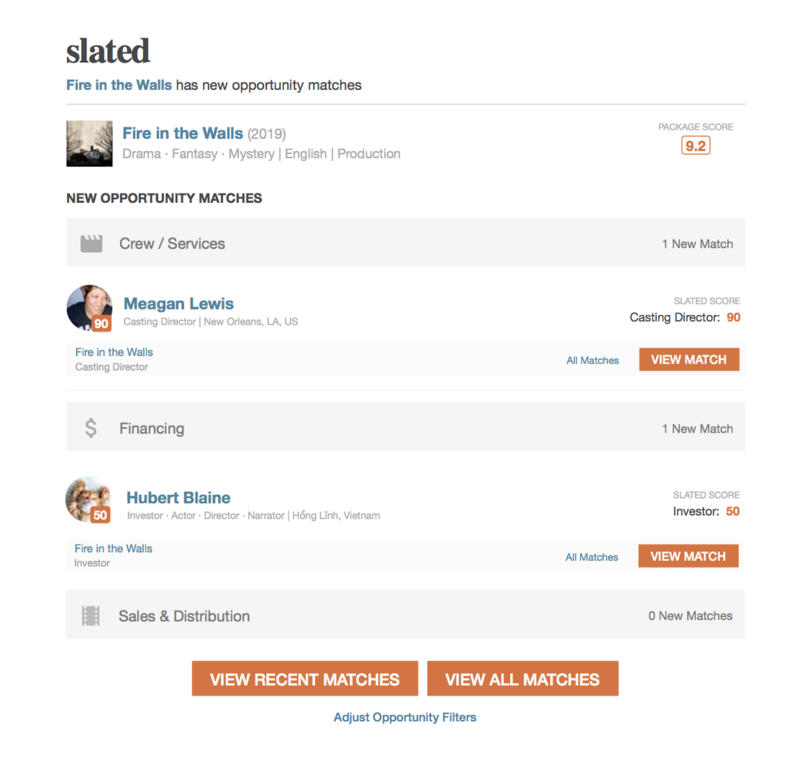 An overview of the site to help you list your first film and leverage Slated's tools to your best advantage. Films listed on Slated have attracted $1.4B in investor introductions to date. Every investor wants to know the same things about your project: Who’s in it, who’s making it, how good is the script, and can it make money? 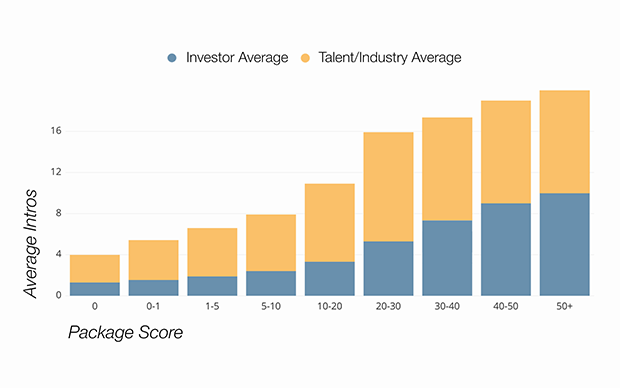 Slated Analytics’ scoring system provides at-a-glance insight to investors for all four of those questions. 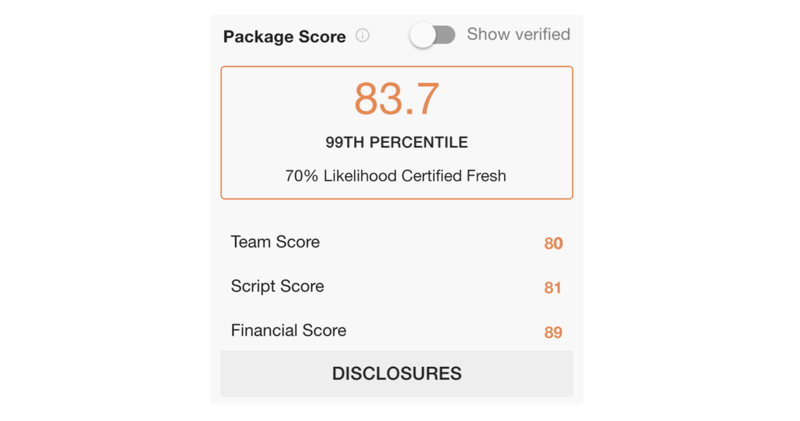 Look to see what your project's Package Score is as a first step. 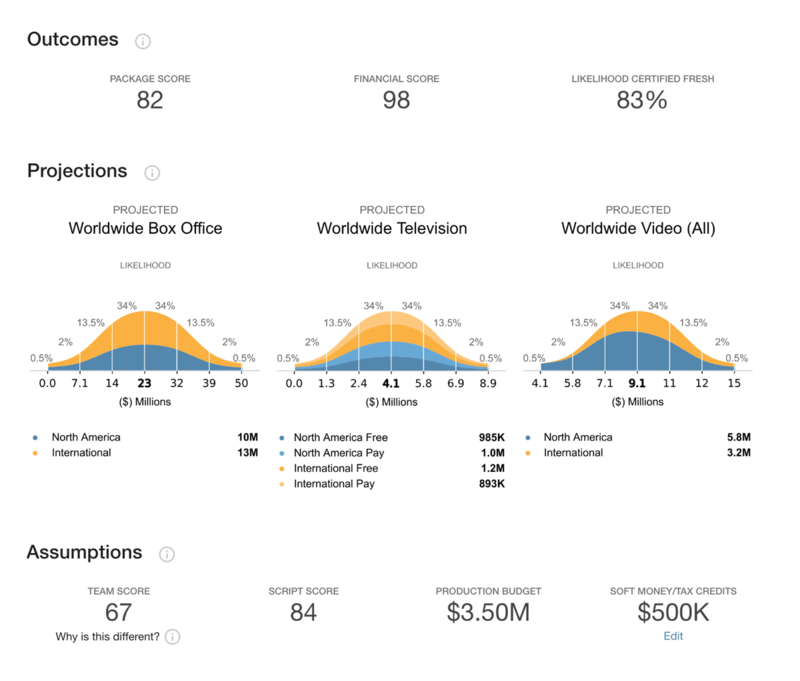 Every project on Slated can already access our entire investor community, for free, but projects with Package Scores of 70+ may be eligible for Executive Producer Services: A “concierge” level of service from Slated Advisors, our film fund managers, who manage the funding process and facilitate all investor interactions, from initial outreach through funding completion. Higher Package Scores mean more introductions. As you can see in the below graph, our internal data indicates that projects with higher Package Scores receive more introductions to investors, talent and industry partners. So keep boosting your team, improving your script and adjusting your financials - it makes a real difference. The more key elements you attach, the higher your team score. Begin by adding principal cast and crew. If you have a sales agent or distributor attached, add them too. Everyone attached to your project becomes a marketable element to get your film financed, sold or distributed. The more team members that are connected to other people, the more buzz you can generate. Get them to sign up, fill out their profiles, add their networks, and connect with the community. Additionally if you need to find talent, you can browse top scoring actors, directors and sales agents on the site, and track those that might be of interest to you, so they can message you. Some of them you might even be able to message directly depending on their privacy settings, others may require a mutual contact to introduce you. List every investor you already have commitments from. The money that you’ve raised looks great to prospective investors. We know that negotiations with film investors are sensitive, but we encourage you to be transparent with your fundraising efforts. Transparency builds trust. And your investors want the film to succeed. They will be the best advocates for your fundraise. So demonstrate your momentum. First, go to your Opportunities tab and list your financing opportunity. This will allow all investors on Slated to be matched automatically with our Deal Alerts, and to discover your project while browsing the site. Slated Analytics’ Script Analysis service is a key step to increasing your project's exposure to talent, financing and sales. The higher your script's score, the bigger the boost in your project's Package Score, which leads directly to more introductions. Learn More or visit the Analysis Services FAQ's. Slated Analytics’ Financial Analysis service is a crucial component of any project's business plan, not to mention a vital way to increase your project's exposure to talent, financing and sales. The higher your project's financial analysis score, the bigger the boost in your project's Package Score. Learn More or visit the Analysis Services FAQ's. Film profiles with videos are far more likely to gain attention from the community and raise more financing. This is your opportunity to pitch your vision in a simple promo, giving sales agents, distributors and investors the full extent of your vision. Once you and your team have networked on the site, it is vital to share your film with your trackers and personal network by clicking the "send an update" and "share" buttons located on the profile page. "Send an update" is for film admins only and allows you to leverage your entire teams' networks. So if you have 5 team members, and they each have 100 different trackers, that means you can reach 500 people at the touch of a button. We are signing on new members, key industry leaders representing capital and influential companies every day and launching more features to help you raise awareness, increase buzz and connect to the community. So open those emails, see who's joined our community and started tracking your project and check back in regularly. When someone tracks you, or one of your team members, you can contact them. We've designed the site this way as we assume that someone is interested in you or your film once they begin tracking. We let you know every time someone tracks you, your team, or your project so that you can reach out, and open up a dialogue. Verified Slated investors can always reach you through your project page. Likewise, you can browse top scoring investors on the site, and track those that might be of interest to you, so they can message you. Some of them you might even be able to message directly depending on their privacy settings, others may require a mutual contact to introduce you.